Coming-of-age films are easy to mishandle because much of the dramatic forward motion is mirrored in the characters, who are often teenagers prone to melodramatic overreactions that come as unwanted guests in the throes of puberty. Heartstone is a film that gets the coming of age right through a remarkable sense of forthright honesty and raw emotion. The emotion is genuine here, too, chronicling a single summer in the lives of four young teenagers simply trying to grapple with the insecurities, the loneliness, and the explosive troubles of pubescence. It’s hardly a subtle movie, but the crescendos of the narrative build organically from what, early on in director Guðmundur Arnar Guðmundsson’s screenplay, is intentionally aimless. That aimlessness is incredibly appealing in this instance, too, because these kids are appealing, even amid their myriad flaws and outbursts of hormonal indignation. Two of them are defined by their suffering loneliness in broken homes. Þór (Baldur Einarsson) is one of three children whose single mother Hulda (Nína Dögg Filippusdóttir) is something of the town pariah upon the decision to become romantically involved with a foreigner of a different nationality. Þór’s sisters, Rakel (Jónína Þórdís Karlsdóttir) and Hafdís (Rán Ragnarsdóttir) are opposites of each other – the former is an attention-seeker who has little patience for quirk and the latter likes to paint and produce poetry – and of Þór, whose budding sexual feelings and practices are complicated by his sharing a room with Rakel. His best friend is Kristján (Blær Hinriksson), whose own home life is perhaps even more dour than Þór’s. His father Sigurður (Sveinn Ólafur Gunnarsson) has won himself a spot of infamy in this small, Icelandic town by picking a fight from which he still sports a blackened eye. He’s an often angry, occasionally violent man who is entirely ignorant of his wife’s concerns and of his son’s increasing, desperate depression. Kristján, after all, is gay, but he is in denial about his sexuality, as well as his feelings toward it. When Hafdís paints a portrait of Þór and Kristján dressed up as two women, those feelings come tumbling out for Kristján. 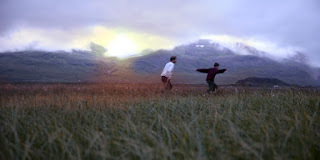 And when the pair of boys meets Beta (Diljá Valsdóttir) and Hanna (Katla Njálsdóttir), a pair of would-be romances strikes up that is based around the exploration of their physical attraction and emotional maturity. This plot, of course, leads to a series of melodramatic developments in these boys’ lives that would feel contrived if not for Guðmundsson’s insistence upon keeping an honest view of his characters and not simplifying them at the expense of their situations. The performances have a significant role in this, with each child actor having a lot asked of them and bearing the weight extraordinarily well under the pressure of heavy subject matter. Some of the third act does bend to contrivance with how it solves one of these subplots, but Heartstone remains an honest account of grappling with the hardest part of growing up. For that, it’s a special film.